I believe in charitable giving. Life can be a challenge and I am no stranger to the roller coaster. However, no matter how difficult things become, I remind myself that there is always someone facing a steeper climb than I. Whether it be a single dollar, a jar of peanut butter or an hour of volunteering, I can afford to help another in some way and you can too! As you all know, this past Sunday I was honored to be a judge in the 3rd Annual NYC Bake-off. It was a wonderful afternoon that not only gathered together nearly 70 attendees, but raised $716.65 for Share Our Strength (nearly double from last year’s event). It was a pleasure to be surrounded by so many philanthropic folks. If you were unable to attend, please click on this link and pledge to end childhood hunger! October 19, 2011 – Red Bank, NJ) – Jon Bon Jovi today announced the opening of the JBJ Soul Kitchen in Red Bank, NJ to a crowd that overflowed the gardens and parking lot at the “community kitchen,” which redefines how the issue of hunger can be addressed. With no prices on the menu, the Soul Kitchen serves meals to customers who have earned them through volunteer hours. The Soul Kitchen operates as a program of the Jon Bon Jovi Soul Foundation and is sustained by cash payment from customers who are able to pay the suggested donation (or even a little more). Joined by local dignitaries, individuals and partnering local non-profit organizations, Jon thanked the Kitchen’s “friends and neighbors” who have assisted in the two-year endeavor to open the permanent location – among them Red Bank Mayor Pasquale Menna, former Mayor Ed McKenna and the President of the Parker Family Health Center, Dr. Eugene Cheslock. The JBJ Soul Kitchen began serving meals in 2009, utilizing two different pilot locations and assessing the patrons’ needs and response to the model, before renovating an old 1,100 square foot auto-body shop as the Kitchen’s new, permanent location. “At a time when 1 in 5 households are living at or below the poverty level, and at a time when 1 out of 6 Americans are food insecure, this is a restaurant whose time has come. This is a place based on and built on community – by and for the community,” said Jon Bon Jovi today. Inspired by the old adage, “teach a man to fish,” diners in need who come to the Soul Kitchen are empowered – they have earned a seat at the table for themselves and their families through volunteer hours at the Kitchen or other local organizations. They are served nutritious culinary dishes by the wait-staff in a lovely restaurant atmosphere with the dignity of having earned their meal. On the other hand, patrons who can afford to dine anywhere are rewarded with not only a delicious meal but with the knowledge that by dining out and leaving the suggested donation, they’ve contributed to their community. In addition to the Soul Kitchen’s own organic gardens, natural food is being provided by Whole Foods Market Middletown, in partnership with their vendors, many of whom are from New Jersey and the surrounding areas. By adopting the community kitchen concept, the JBJ Soul Foundation has expanded its efforts – from affordable housing to hunger – as it celebrates its fifth anniversary as a non-profit organization. The JBJ Soul Kitchen is currently open from 5-7 Thursday, Friday and Saturday. 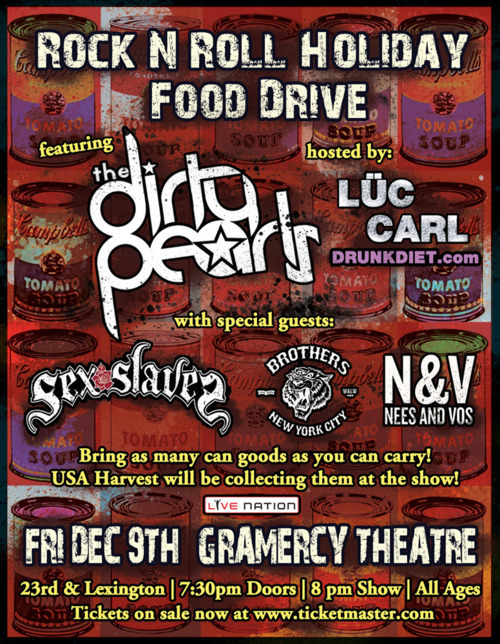 And for those of you who would prefer to mix a bit of Rock & Roll with your charitable contribution, check out this concert at the Gramercy Theater on 12/9!